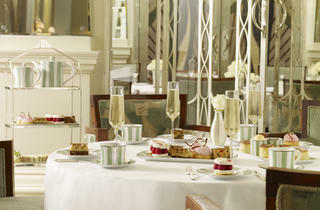 A space for afternoon tea at Claridge's. The best afternoon tea I've had in London (much better than The Ritz). The venue is simply superb and the wait staff are courteous and eager to please. You can select your tea and sandwiches/cakes are frequently replenished. Perfect location for a special occasion. They'll even give you chocolates to take home with you. 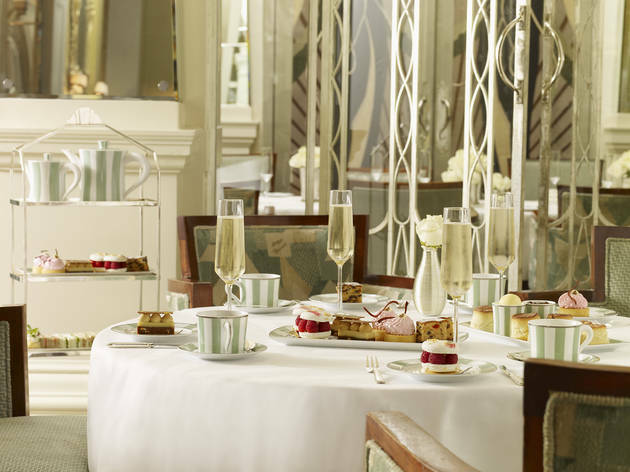 For a quintessentially British afternoon, this is the place to go. I can't rate it high enough! We actually ate dinner here, which was at 1930 and people were still having afternoon tea! Blimey that's more evening tea. The service here is impeccable. We started off with a glass of champagne and the man offered me many suggestions when the first one was a bit too dry to my liking. Of course, new glasses were issued (no reuse!). I started with the beef carpaccio which was absolutely delicious. Topped with an egg (which I can only describe as a scotch egg without the sausage), the yolk was wonderfully runny and just paired beautifully with the meat. The husband had the crab salad which was light and refreshing. Being a Dorset boy he was sold. For the mains I had a lamb wellington and the hubby a chicken pie (apparently it is a firm favorite and is never taken off the menu, even in summer). Oh. My. Goodness. Just wow. The lamb was cooked beautifully and was nestled in a blanket of puff pastry and mash potato. It had broad beans on the side as well as a couple more buttery dollops of mash. Heavenly. Although the pie was a 'topper' I could not fault it as it was deliciously creamy with generous helpings of chicken. When you book Afternoon Tea at Claridge's you expect a feast... and on this they did deliver! While at the higher end of the afternoon tea spectrum at £50 per person (before you add a couple of glasses of champagne at £18 a glass), this is definitely worth a trip, although, perhaps, only once in a lifetime. The cakes are varied, beautifully presented and delicious and the sandwiches, too, are lovely. It is worth noting that your plates of cakes and sandwiches will be replaced if you manage to get through them and if you don't clear the table in a second helping (which is impossible) you can take anything that remains home in a doggy bag. We took my Mum here as a birthday treat and were joined by the whole family, including my 2 year old niece, who encountered sugar for the first time. While the piano played gently in the background my niece teared around the room wearing a chef's hat, dancing in front of the pianist and getting under the staff's feat on numerous occasions, but they continued to be gracious and even played with her, making the whole experience seem less stuffy. We have since bought gift vouchers as wedding gifts for friends and family, which have been very well received, and it is definitely worth a visit for a special occassion – Just make sure you book a couple of months in advance!